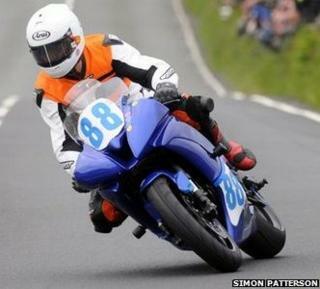 A motorcyclist has been killed during the first Supersport race at the Isle of Man TT, organisers have confirmed. Bob Price, from Stroud, Gloucestershire, died in a crash at Ballaugh on the third lap of the 37.5 mile (60 km) Mountain course earlier. Organiser ACU Events said the 65-year-old was an experienced road racer and an investigation into the accident was under way. The coroner of inquests has also been informed. Mr Price, a car body repair shop owner, first competed at the TT in 1992, ACU Events said. His racing career highlights include a third-place finish in the MGP Junior Classic and runner-up in the Senior Classic, both in 2002. A spokesman for the organisers said: "The ACU wishes to pass on their deepest sympathy to Bob's family and friends."